Reds, greys, and plums will always have a place in my fall manicure rotation. This season though, I find myself reaching for deep, dark metallic hues with richness and depth, shades that sometimes change colour depending on the light. Here are my top favourites. China Glaze 'Smoke and Ashes' and 'Stone Cold' ($8 each, available at Spa Boutique) are both part of the limited-edition Hunger Games collection, which, luckily for us, is still available online. 'Smoke and Ashes' is black with metallic green glitter, while 'Stone Cold' is slate grey with pewter-coloured glitter. Both go on darker than they appear in the bottle and change colour in bright light. Plus, they both feature China Glaze's signature 3-free long-wearing formula. I'm more than a little in love with Estee Lauder Pure Colour Nail Lacquer in 'Viper' ($25, available at Holt Renfrew), a metallic green so dark that it looks black except under the brightest of lights. Estee Lauder's creative director Tom Pecheux created this shade and the other rich hues in the Beyond Black collection intending to "capture the intensity and naughty side of Paris when it truly comes alive." 'Viper' is sophisticated but edgy, so mission accomplished, I'd say. Although I'm not a fan of how quickly it chips, I just can't say no to Butter LONDON's clever names and pretty colours. 'Shag' ($17, available at Spa Boutique)--a lovely copper that looks like a bright, shiny penny--is part of the new autumn/winter 2012 collection. Metallic blue 'Big Smoke' ($17, available at Spa Boutique) is an oldie but a goodie. What are your favourite fall polishes? Love both of the butter colours. 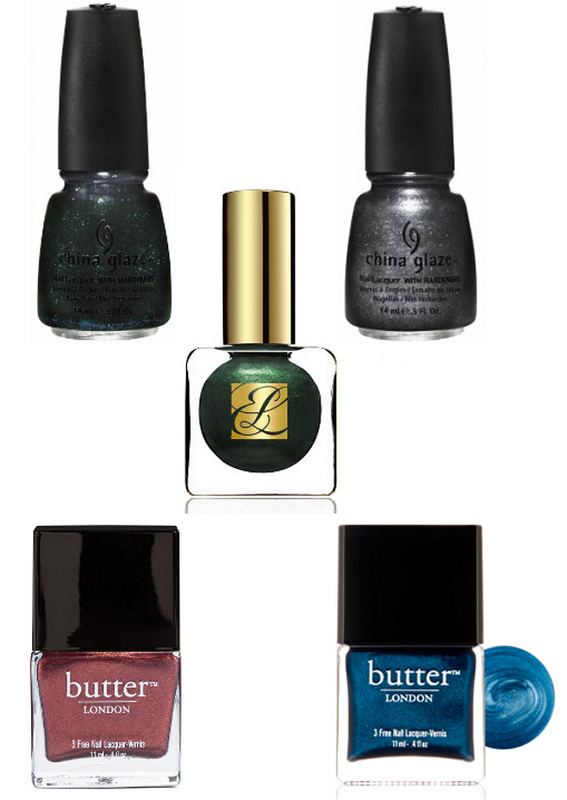 'Blue Smoke' is awesome and 'Shag' looks perfect for the upcoming holidays.